So I’m behind in posting reviews for the 2011 Speculative Fiction Challenge – but that doesn’t mean I haven’t been reading! While I was on vacation, I read the Uglies, Pretties, and Specials by Scott Westerfield; Sunshine by Robin McKinley; and Delirium by Lauren Oliver – A one-word-title YA specfic blitz if I ever saw one! Westerfield tackles genetic engineering in a future where people are transformed from “uglies” to “pretties” at age 16. And main character Tally can’t wait. But when her friend Shay escapes to Smoke, a settlement of outcasts where uglies don’t have to get the operation, she is questioned by the formidable Dr. Cable from Special Circumstances who is desperate to find Smoke and stomp it out of existence. Dr. Cable coerces Tally into finding the location of Smoke. If she succeeds, she’ll get the operation and live happily ever after in New Pretty Town. If she doesn’t she’ll be an ugly forever. Which, for Tally, is not an option. It’s a tough balance – humanizing Tally and making us care as she risks her life to find Smoke, even though the reader knows she’s going there to destroy what her friend has worked for. But Smoke is nothing like Tally expects, and she starts to question whether she actually wants to become a pretty. Through permutations of the plot that I won’t go into here, Tally becomes Pretty in Pretties, and later she becomes a Special in — you guessed it — Specials. The action never wanes for long in any of the three books, and Westerfield gets credit for his inventive use of language, especially as it pertains to each stage of, well, existence: Ugly (tricky), Pretty (bubbly), Special (icy). There are no easy answers with respect to the main conceit of “pretty-making” and whether Tally even knows what she wants anymore, being so damaged by the operations and the emotional trauma that comes with them. It’s also unclear at the end of the story to what extent she is capable of appreciating normal (ie, ugly) standards of existence, even as she goes off into the sunset with David, her ugly love interest in Uglies, and opponent in much of Pretties and Specials. (Full disclosure: I have not read Extras, so I do not know if these lingering issues are addressed there.) But nonetheless, I found the books to be an entertaining read. I haven’t read a book by McKinley since The Hero and the Crown and The Blue Sword – both of which I read (and loved) in the 7th grade. So when I saw the trade paperback of Sunshine deeply discounted at Borders, I thought why not, since I had fond memories of her work. But I have to say it took me a while to get into the story. It’s first person – so obvious and idiosyncratic – hey, this is a story! – that I kept fighting with it until finally, I just gave in and let the story be told in the manner it would be told in. That’s when I started enjoying it. 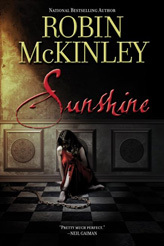 In a world that’s been to the brink and back from wars waged between humans and demons, vampires are the worst group a human like Sunshine wants to be caught up in. But when she is abducted by a crew of vamps and left as a snack for another vampire prisoner, she must either join forces with him to escape and live or, well, you know. An alliance between a human and a vampire is unheard of, and both Sunshine and the vampire Constantine suffer side effects from merging their powers as they work together to bring down Bo’s vampire crew once and for all. Add in magic, wards, Special Other Forces (ie, demon cops), and more than you ever wanted to know about baking. Constantine and Sunshine have shared so much by the end of the book – trust, despite their opposite natures, and one scene of such delicious tension that I will never think of the word “bruise” the same again. McKinley leaves it wide open for further adventures. But I was sorely disappointed to learn there are no plans for more. I’d say I felt gypped, but once I learned to embrace the voice of the story, it was unputdownable. 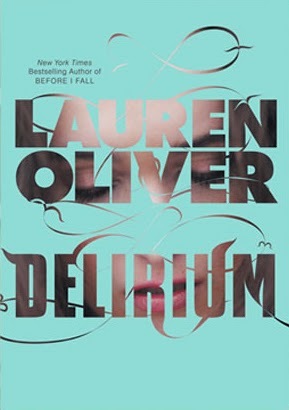 I heard good buzz about this book on some of the YA sites I haunt and the premise of Delirium is intriguing: a future society where love is considered to be a disease, and people have an operation at 18 to ensure they do not catch it. Main character Lena is only a few weeks away from her operation, and she is initially thrilled to get fixed. She is still plagued by the shame of her mother’s suicide when she was younger, since her mother had the disease. Now she lives with her strict aunt and cousins in a place that’s a bizarre cross between the movie Pleasantville and the book The Handmaid’s Tale, with segregation of sexes among the uncured, spouse assignments which dictate your place in society, and brutal raids to ensure compliance with all the rules. But then she meets a boy, and not just any boy, but one who gives her the disease Delirium. She hides her symptoms while falling deeper into love with Alex, who shows her the dark side of the society she’s been raised into. Oliver’s sentence-level writing is amazing, especially her descriptions of Lena’s emotional state as she falls in love. Each chapter starts with a brief excerpt from manuals, textbooks, and laws to aid in worldbuilding and show how this society has gotten to this point – a very effective device. I found the ending to be a bit predictable given the prominent references to a certain Shakespeare play that I won’t mention here for those of you who haven’t read the book. I was also surprised to learn that there are two more books slated to follow Delirium. But given the quality of the writing, I’m interested to see where Oliver takes this story. Be sure to check out other July reviews for the Speculative Fiction Reading Challenge. I finally finished the Uglies series this month. I wasn't as keen on Extras as I was on the other three. I really want to read Delirium…Thanks for the reviews! Nice reviews! I too really liked the use of invented slang in the Westerfeld series. It was creative, used enough to make it feel authentic in the world and you could always figure out what the slang meant form the context. I downloaded a sample of Delirium on my Kindle. Sounds like it's time to give that one a go! Oh sweetness, these are all on my to-read list 😀 I'm especially looking forward to reading The Uglies and Sunshine.